We're super excited to have Maria Haidamus on board as one of our newest Elite designers. Having grown up in Lebanon and studied design at Academy Libanaise des Beaus-Arts in Beirut, she brings a global cosmopolitan aesthetic to her design work. Now residing in San Francisco with her family, Maria's work exudes a combination of a sophisicated, old world look mixed with that California cool style. With the beautiful architectural details of the house, Maria decided to paint the walls a warm white and kept the furniture lines clean. The neutral palette became a backdrop for a mix of organic textures and finishes, found objects brought back from her travels and time aboard with pops of vibrant colors. Today, we ask Maria to take us on a tour of her home and gives us a few tips on how she mixed old world design with a more modern vibe. I like to use a variety of textures and materials in my designs. In this case, I used a small lucite ottoman to give some levity to the seating area and keep the look fresh and not so heavy. I used a soft, neutral and durable linen fabric on the banquette and added a faux fur pillow to bring in more texture. Unexpected pieces sprinkled into a design can add personality and a unique touch. 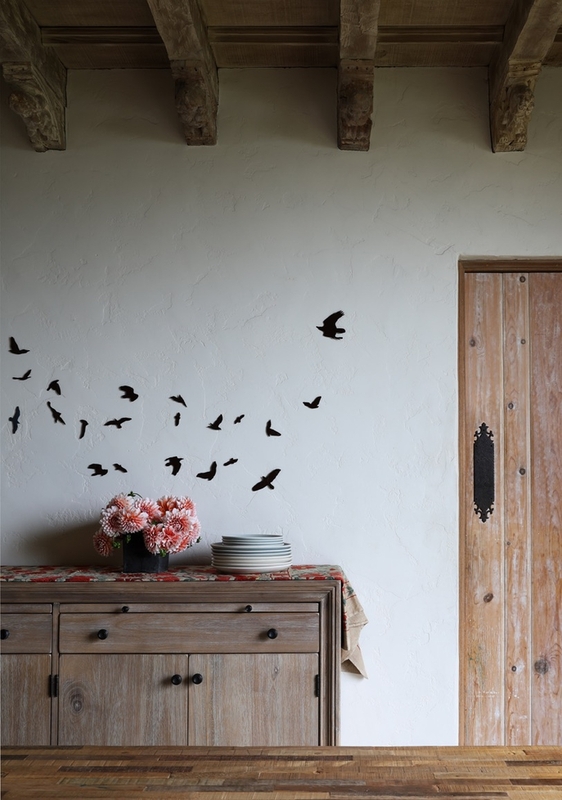 I wanted an element of surprise in my dining room and worked with an artist to create these whimsical metal birds. They have become a real conversation piece and the focal point in the room. Don't stick to a single style or period in your design. 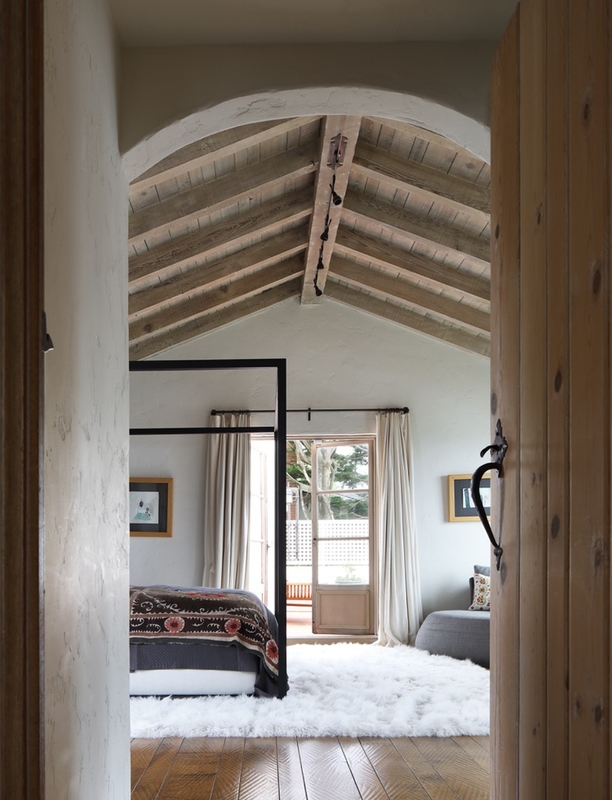 The most livable and inspiring rooms combine both old and new pieces in a variety of styles to give a room a sense of having been assembled over time. I used a glamorous white shag and more modern furniture pieces in my bedroom to give it a fresh, warm look. We like to entertain and have friends and families over. Of course, I knew it would be fun to have a designated bar area that would combine both form and function and a bit of our personalities. You can do this with a barcart or a console table. It makes a great gathering area when you entertain. Living in California we're able to use our outside space quite frequently. I wanted my patio to feel like my childhood visits to the countryside of Spain and Italy. 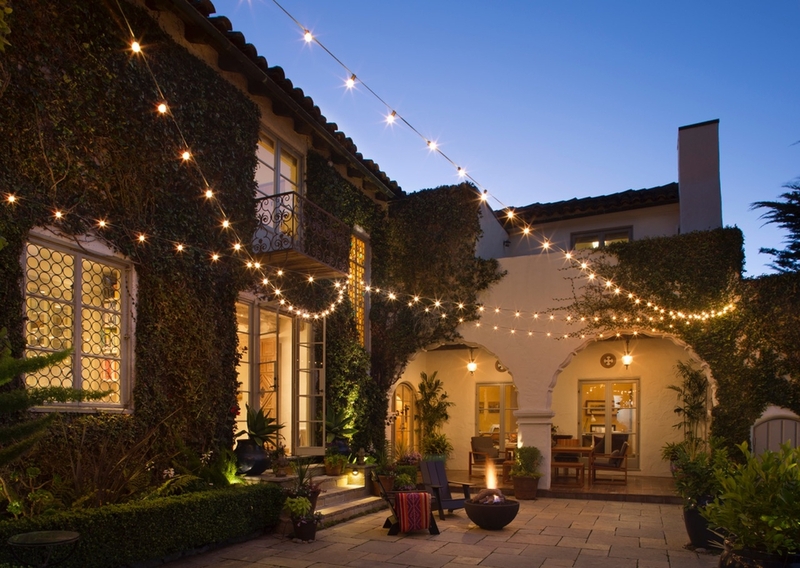 We strung lots of lights, added a fire pit and lanterns to give the space ambiance and make it festive and inviting. If you're drooling over Maria's house and her beautiful design and want her to work on your space then be sure to pop over to her designer page to start your own design project today. Maria can work with your needs and budget all online and deliverd right to your inbox!